The former Brown Brothers Harriman headquarters, at 16th and Walnut Streets, has been renovated and expanded into apartments. The apartment project is being called The Beacon and was developed by Pearl Properties. The Beacon reuses a former pre-War office building in the heart of the upscale Rittenhouse Row shopping district. The first floor has an Under Armour retail store and another retail space that has not yet been filled. The Beacon is, also, around the corner from The Condo Shop’s office at The Aria Condominiums at 15th and Locust Streets. The Beacon has 98 upscale rental units in the existing six-story building and in the eight story addition above. The addition includes a tower section that runs the full fourteen stories next to the existing building. The seventh floor has a deck facing busy Rittenhouse Row and a movie/screening room, a business center, a fitness center, and a clubroom with a fireplace, a catering kitchen, a communal table, televisions, and games like billiards and shuffleboard. The units are one and two bedroom units and can be customized. They have high ceilings, hardwood flooring, washers and dryers, and gourmet kitchens. The exterior has beige brick and large windows on the west side of the expansion and horizontal ribbon windows on the east side. 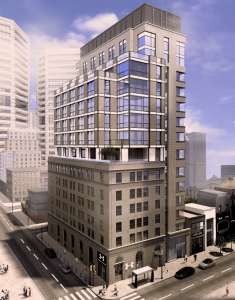 The Beacon is a stylish addition to the very upscale Rittenhouse neighborhood. It reuses a beautiful building and adds a modern addition to Walnut Street, as well as, adds new retail to the fancy shopping district. If you are interested in rentals in Rittenhouse, you can stop by The Condo Shop office at The Aria, at 15th and Locust Streets, to help find the right place for you.